Samsung initially had to delay Bixby’s launch in China following revisions to local cybersecurity laws. The company expanded Bixby Voice to more than 200 countries across the globe in August this year, China included. The assistant only supports English and Korean languages right now. Samsung has been working on adding support for the Chinese language. 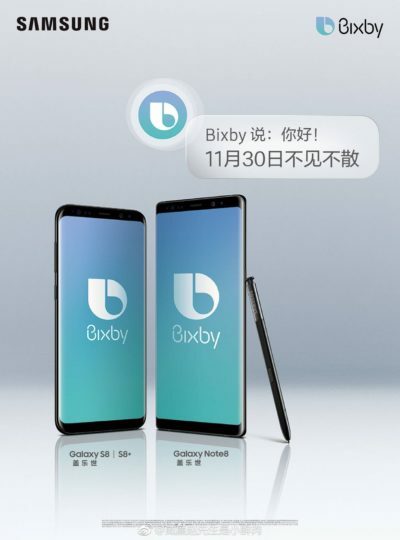 With the beta that it launched a couple of weeks ago wrapping up, Samsung has now confirmed that Bixby Voice Chinese support will be launched on November 30. Samsung China added support for the Chinese language to Bixby in beta a couple of weeks back. The beta participants were encouraged to use the Bixby Voice feature frequently so that the assistant can get a better understanding of the language. It wasn’t surprising to see that many Galaxy S8 and Galaxy Note 8 owners in China were waiting for Bixby to support their language. Bixby Voice is currently supported on three handsets – the Galaxy S8, Galaxy S8+ and the Galaxy Note 8. The day Samsung announced this beta all 15,000 spots were filled up very quickly. Samsung China previously confirmed that this beta test would conclude on November 29. It has now revealed that the Bixby Voice Chinese support will go live on November 30. I am losing hope that they’re going to put other English dialects (languages) on Bixby Voice. Its great that Bixby does actually recognise some English words – UK English I mean, but it still doesn’t pick up names, places or even complete sentences properly. But works perfectly when I put on an exaggerated American accent.